Wabash College immersion learning trips are not limited to spring break. Students are off to Scotland and Germany as part of their 2006 spring semester classroom experience. The homepage photo was taken shortly after the theater group's arrival in Edinburgh. They have posted several entries to their blog. The trips won’t end then either. After graduation the College Glee Club will be touring the United Kingdom while the football team travels to Panama. All four trips will be documented by daily updates on Wally Blogs. The students will be writing each day about their learning experience, cultural immersion, and their free time. You can look to the Wabash College homepage to follow each trip. The trips leaving Saturday feature Professor John Byrnes’ German 202 class on language and culture. Dwight Watson’s Theater 210 class on playwrighting will be off to Edinburgh and Aberdeen, Scotland. The German course focuses on the student’s command of the German language through practice. 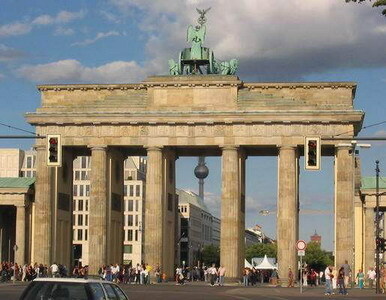 The students will be spending their immersion time in Berlin staying in a youth hostel, visiting museums, government buildings and traditional stops like the former Berlin Wall, Checkpoint Charlie, and Brandenburg Gate. Byrnes has led the trip for six years and was the first Wabash professor, along with the Art Department’s Doug Calisch, to regularly establish immersion learning experiences as we know them today. But off-campus learning goes back more than 20 years. The College's Biology Department has taken students to places like Yellowstone National Park and the Everglades through the years. Watson will be leading his first-ever group abroad. He recently visited Scotland and met with faculty members at the University of Aberdeen who suggested bringing his students to Scotland. "I filed the idea away until I began to plan my playwriting class this spring semester," Watson said. "Preparing the course, and encouraged by my visit to Scotland, I began to consider the impact a Scotland immersion experience might have on my course design and the creative writing of my students." The group will arrive in Edinburgh Sunday and enjoy the arts and culture of the city. Three days later the group will be off to Aberdeen to meet with the creative writing faculty and theater students at the University. They will attend the opening ceremony of World Festival 2006. The Festival is a popular annual literary event that includes lectures, exhibitions, film screenings, and performances by Scottish and international writers. 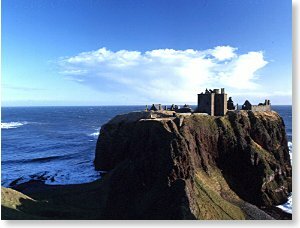 While in the Aberdeen area they hope to visit historic sites like the 12th century fortress, Dunnottar Castle (film site for Zeffirelli’s Hamlet). Watson admits taking his first students abroad is a bit of a daunting task that he’s savoring with good humor. "This is my maiden voyage as a trip leader," he reiterated. "To the older Scots, a "maiden" was a beheading device. Naturally, I'm a little nervous about the voyage, traveling with thirteen lads. So, let me call on your good thoughts and well wishes, anything to keep the head where it belongs and the lads from lingering too long in the howffs (pubs), finding themselves in a tolbooth (jail), with their kilts over their heads."